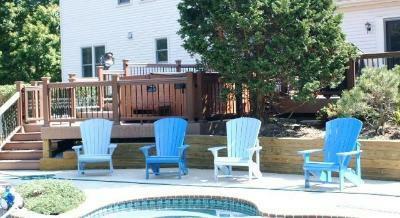 This Montgomery Village redecking project provides more room for family, free time and fun! When we initially met with the homeowners they told us that in their quest to improve their existing deck they had been told by several builders that due to the age of their deck, which was nearly 20 years old, in order to accommodate their needs and desires the deck would have to be completely torn down. As you can imagine, demolition and starting from scratch can not only interrupt your lifestyle for an extended period of time, it can also mean additional costs to the homeowner. Through our experience we realize that in many cases things aren’t always as they seem and even though a structure has some age doesn’t eliminate it as a redecking candidate. The key is to inspect the structure thoroughly to determine if it is structurally sound enough to facilitate the upgrades in mind. 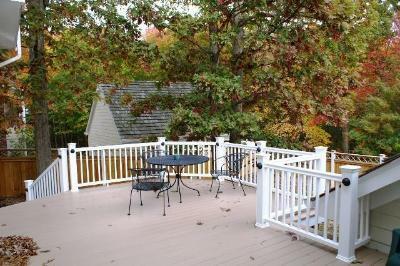 In the case of this Montgomery Village deck, it had aged gracefully and was deemed structurally sound enough to proceed with the project. The two main reasons the homeowner’s wanted to redeck their existing space was #1 to upgrade to a low maintenance material which would stay beautiful without the worry of constant cleaning and sealing and #2 to have their outdoor living space better accommodate spending time outdoors with their family. Design rendering for Montgomery Village redecking. As you can see from the design renderings we prepared for these Montgomery County homeowners, and the stunning images, this project promises to fulfill all their needs and desires. 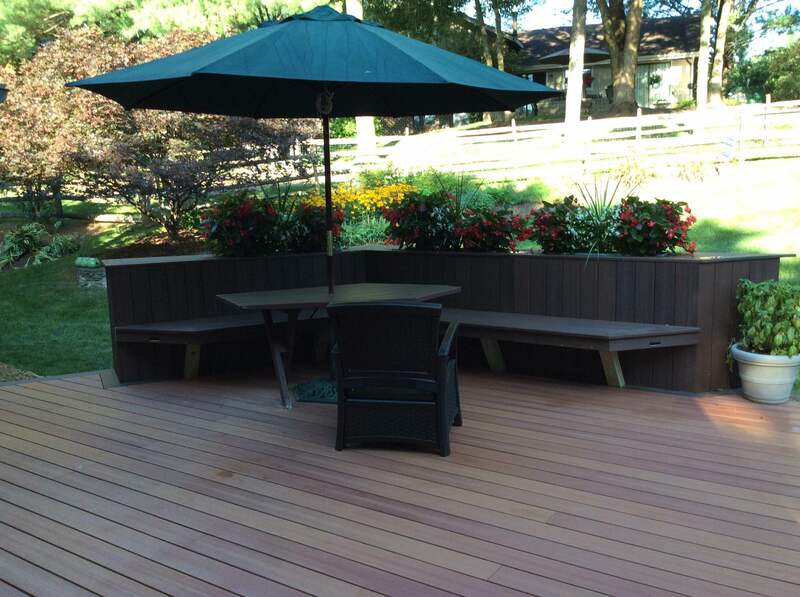 In addition to redecking the entire structure with low maintenance Fiberon Pro Tect decking in Western Cedar, we also accented the deck with a border of Fiberon Pro Tect decking in Chestnut to add style and define the space. This decking is capped on three sides with a protective PermaTech surface, making it highly durable and carries a 25-year limited warranty against staining and fading. Archadeck of Central MD also faced the planter boxes with the same decking material in order to blend and unify them with the new look of the deck. We also enhanced the convenience of keeping the plants and flowers the homeowners use within the planter boxes by installing a hose extension to the existing hose bib near the deck directly within the planter boxes for easy access. In the coming weeks ahead, we will also be adding a paver patio complete with a fire pit purchased by the homeowner just off the deck to increase the outdoor enjoyment even further! This project serves as a good example of our expertise and knowledge of the business, which speaks volumes about the way we do business. It’s one thing to say “we build beautiful decks or we can build what you want”, but it’s quite another when a company can show you a portfolio of their work as Archadeck of Central MD can. If you’re meeting with multiple contractors to consult on your desired project be aware that not all builders will have the same opinion of what is possible or the experience or expertise to complete your project properly. Rest assured, we listen to your needs, desires and inspect the proposed structure you wish to upgrade thoroughly to explore all viable options available to you in order to bring your outdoor vision to life. 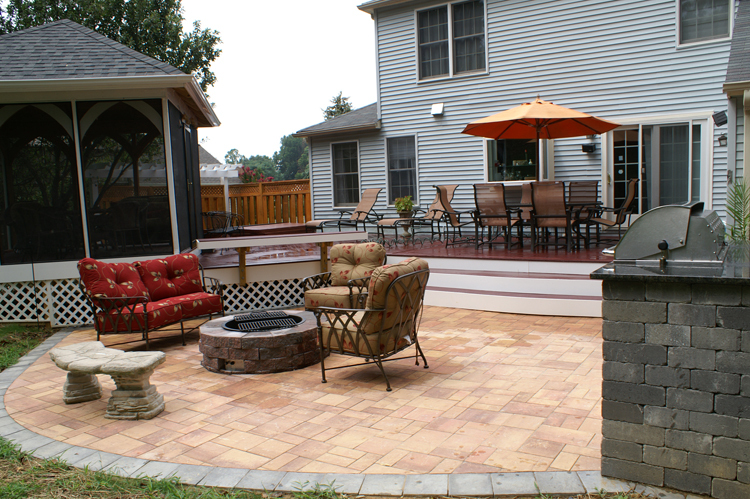 If you are considering updated an existing space, or staring an outdoor living space from scratch, contact Archadeck of Central Maryland today to learn more about our unforgettable designs and quality craftsmanship. Call us at (301) 926-3001 or email us at centralmaryland@archadeck.net. Our consultations is free but the results can be priceless! 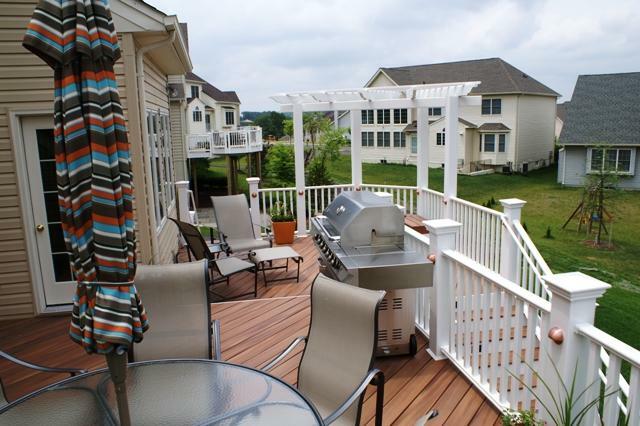 Choosing the decking material that’s best for your outdoor living space is easy with Archadeck of Central MD! 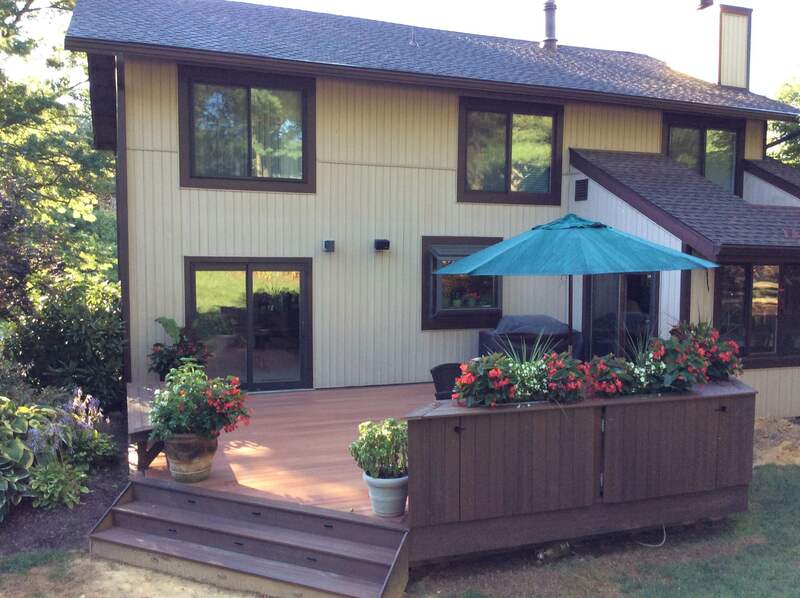 This AZEK deck is accented with a TimberTech Radiance Rail. You’ve chosen the placement, the type of structure and the size of your new outdoor living space, so now it’s time to select which material to use for its construction. For today’s forward thinking homeowner, synthetic decking, the low maintenance green building material, is consistently a top choice. Contrary to popular belief, not all synthetic decking is the same. In fact, synthetic decking is broken down into three categories based upon its anatomy: composite decking, solid PVC and capstock decking, with manufacturers including TimberTech, Fiberon, AZEK and Trex. Although all three categories possess certain similarities, they also have distinct differences as shown in the detail of each below. Traditional wood/plastic composite materials are available through many of the top brands we carry, such as TimberTech, Fiberon and Trex. Traditional composites consist of a combination of wood fiber and resin. This pairing of wood and plastic provides an impressive durability (the likes of which wood has never been able to provide), an uncanny resistance to splintering and rotting, never requires staining or painting and is extremely economical. The downside is the potential for discoloring; due to the presence of wood in its formula, wine, oil and grease can stain the deck because of the porous nature of the wood fibers. These high-quality composite decking materials are covered by warranties that exceed those of any wooden deck on the market. Solid PVC decking, such as AZEK, is impervious and offers superior stain, insect, mold/mildew, scratch, fade, and split resistance. Grease, oil, wine or fruit punch will not discolor this decking material and there’s never a worry regarding patio furniture or pet scratches with solid PVC. Disadvantages for this category include a potential for expansion in the heat due to the elasticity of plastic, a lack of a more authentic wood texture and with all of its high-tech resistance, comes with a higher price tag. AZEK decking in beautiful “Redland Rose”. One of the newest synthetics is a composite wrapped in PVC or other high performance shell, often referred to as capstock decking. The advantages of this combination include reducing the amount of maintenance required by the homeowner, and more specifically a decrease in the amount of cleaning required to keep the deck looking new. Capped composites, or capstock manufacturers include Trex, Fiberon and TimberTech. Capstock decking offers the best of both worlds through superior stain, fade, scratch, and insect resistance while still giving you the beauty of real wood with moderate pricing. In addition, capstock offers warraties against fading and staining. When comparing quality and performance of the manufacturers of synthetic decking materials, Archadeck of Central MD offers a diverse lineup of low-maintenance, high-performance wood alternative products which can handle the outdoors without depleting them. The long list of advantages of each brand far outweights any disadvantages, (as if there are any!) and include: high resistance to elements, impervious to mold, mildew and insects, wide spectrum of beautiful colors and grain patterns and affordability. No matter if you are selecting the building material to re-deck your existing structure or for your new deck, you want one packed with versatility and beauty and choosing it shouldn’t be a hassle. 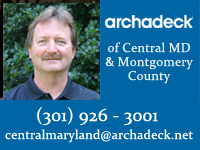 Archadeck of Central Maryland is a trusted and respected industry leader. We have the experience to consult effectively with our customers on manufacturer and material selections. We can help you review and choose the right material to suit your needs, your lifestyle and your budget. Contact us today to learn more about synthetic and other outdoor living material options. Call or email for a free consultation: (301) 926 – 3001 or central-maryland.archadeck.com. Composite, PVC or Capstock Decking? That is the question. Composite, PVC and capstock decking materials are fairly new to most of us although they are trusted and true materials in the world of outdoor structures. You may have heard about all of these different types of expensive, fancy and maybe good decking materials, but the dilemma is how does the homeowner make sense of it all? 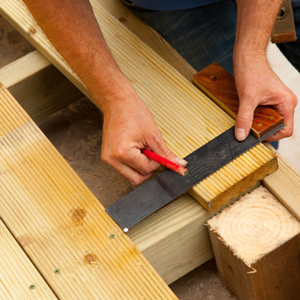 When selecting a material for your new deck or re-decking needs, the variance in selection can make this task quite daunting. 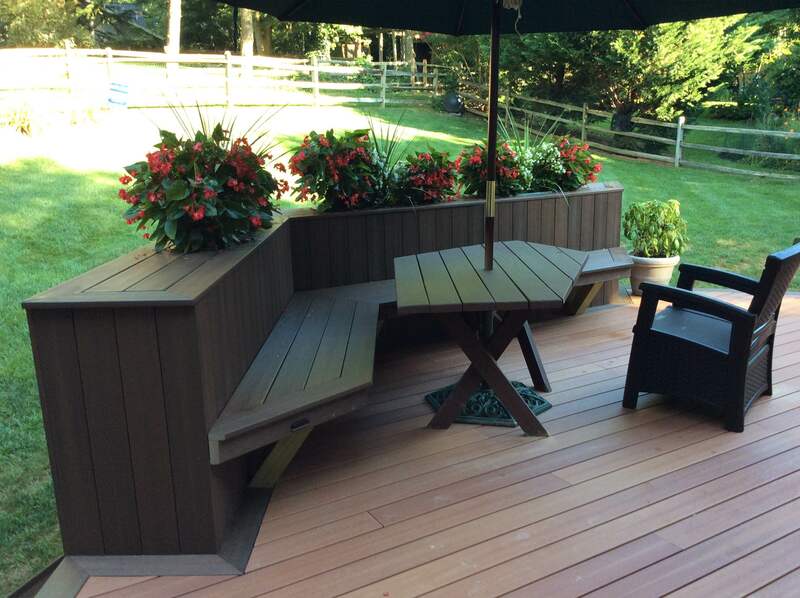 Archadeck of Maryland wants the task of selecting the right material for your individual needs to be an easy and pleasant experience, this is why we have taken the three basic types of decking materials and broken them down to explain the basic components and functions of each group. 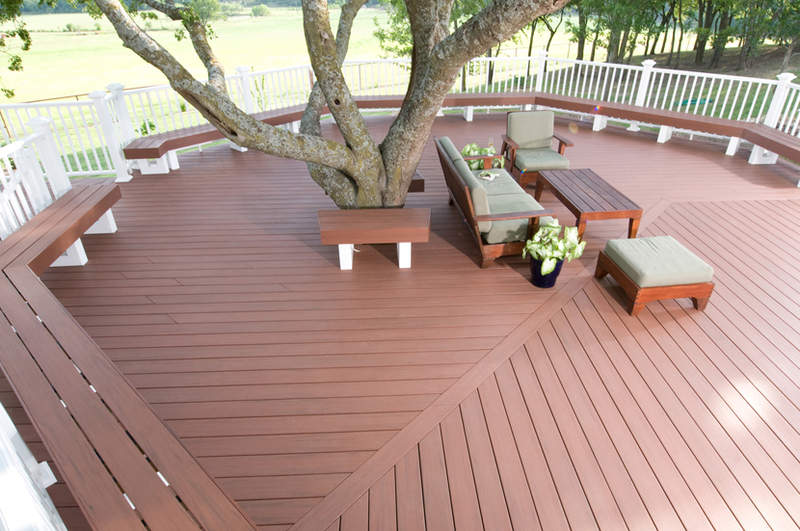 Composites ( also known as synthetics) are by far the oldest decking product on the market. Composites have been around for quite a few years, and being the oldest means all, or most, of the “kinks” have been worked out with this product. Over the years we have watched this product improve greatly in appearance as well as durability. Many composites promise the best of everything, from stain resistance to low maintenance and a myriad of other benefits. Because there are now so many choices and options within the realm of composites, we want to quell the fears of the unknown by giving homeowners a simple and concise picture of what these types of decking are and the pros and cons of each. Composite decking material requires a lot less maintenance than its solid wood counterparts – even those treated with preservatives. Composites can be made to emulate the look of real wood, with wood graining that in a quality composite can rival the real thing. A high quality composite can also inhibit the growth of mold and mildew by the addition of mold inhibitors present in the makeup of the composite. Composites can be cleaned by simple soap and water cleanup. If stains sit for a period of time, they may take a little more effort to clean. There are many good composite cleaners on the market. As with any deck that contains natural derivatives you will still have to contend with fading, scratching and dirt. Composites, even though they do require maintaining, do no compare with the chore of staining and painting on an annual basis that is necessary with a pressure treated or other entirely wooden deck. One composite brand we use quite a bit of is Fiberon Professional. Fiberon Professional requires no painting, staining or sealing. It comes in rich colors and is resistant to termites, splinters and decay. TimberTech is another well-known brand of composite decking. Their line offers scratch, stain and fade resistance that carries a 25 year warranty. TimberTech, like the majority of the leading composite manufacturers has created stunning similarities with the appearance of the composites with wood graining and details that closely resemble the look of real wood. In the case of these quality composites it is like real wood, but even better. 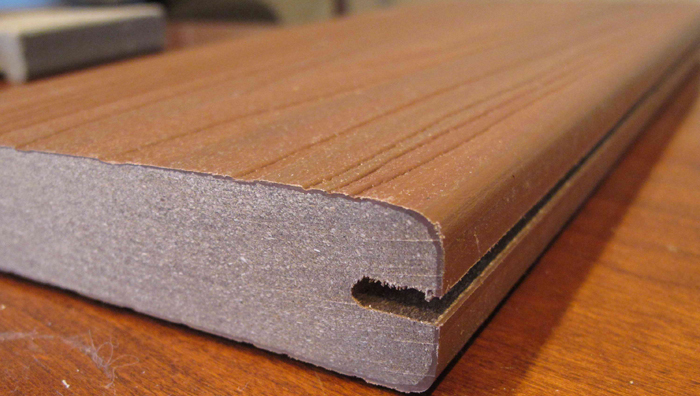 Cellular PVC decking is very high performance and similarly is most often the more expensive option. 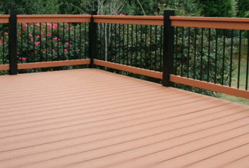 PVC decking materials have fade and stain protection through their warranties. PVC is a solid cellular plastic. This makeup creates a non porous and denser decking material. PVC decking only requires minimal maintenance. It will not fade, warp, crack, splinter or stain. PVC is also moisture friendly and is used heavily around pools, spas and as a docking material. 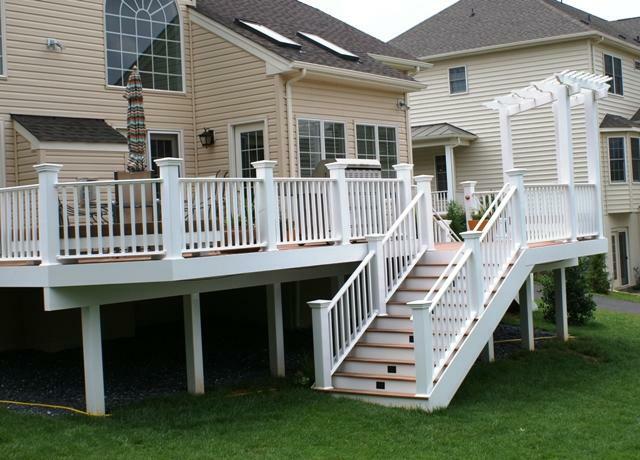 When you think in terms of the price point when choosing any decking material, Archadeck of Maryland urges the homeowner to take the long-term investment into consideration when choosing the material for your deck. PVC has superior protection because of the 25 year stain and fade warranties that some PVC manufacturers offer, but that type of quality does cost a bit more. We really like Guardian Elite decking and use it quite a bit. 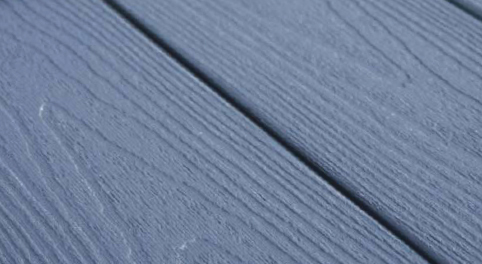 Guardian Elite decking offers very strong fade, stain and moisture resistance. 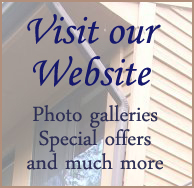 It does not require any painting, staining or sealing – ever. No splinters. No cracking or rotting. And, it’s resistant to mold, mildew, fungus, moss – and even insects. Fiberon Horizon is a product that we have used many times and has proven itself as a superior PVC material. This product uses PermaTech innovation to offer superior stain and fade protection and only requires soap and water cleanup. There are other PVC brands on the market as well such as AZEK and TimberTech XLM just to name a few. This Fiberon deck is breathtaking when accented by this vinyl pergola. Capstock is the newest material on the market. It is made up of a proprietary PVC polymer shell and contains a composite wood and recycled plastic core. It is considered a composite decking material but boasts a durable PVC shell. 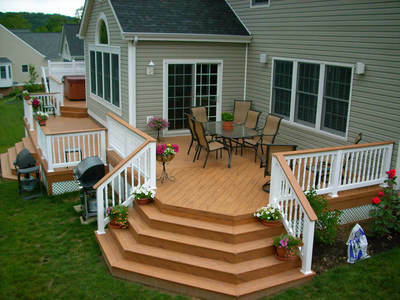 It is also known as a composite hybrid, as well as being referred to as capstock decking. These products are being backed with some of the best warranties in the business, therefore we expect good things from Capstock products. As far as capstock goes, we really like Guardian Prestige and Fiberon Horizon. The Guardian Prestige line has advanced fade, stain and scratch resistance. Like other composites and capstocks, it requires no painting, staining or sealing. Guardian Prestige has a very nice realistically embossed woodgrain. On top of that, it’s made right here in the USA. Guardian Prestige comes in four colors: Pewter, Weathered Wood which you see above, Cedar and Walnut. 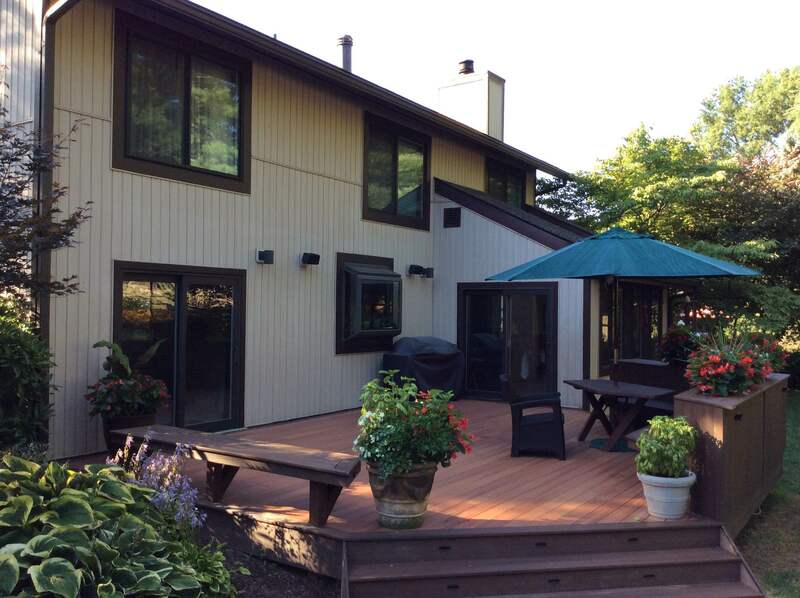 Another really strong capstock decking material is called Fiberon Horizon. The Fiberon Horizon line offers the look of tropical hardwoods with some of its darker colors including Ipe, Rosewood and Tudor Brown. It’s that time of the year, when the weather is hot and the living is easy. The kids are on summer break, and summer is a time when the whole world moves just a little slower, more relaxed, a time for friends family and the great outdoors. 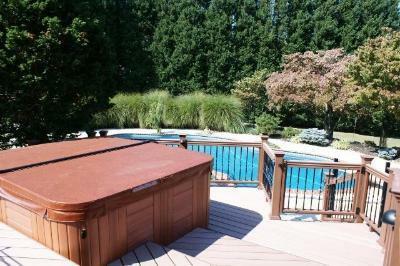 A great way to cool off, slow down and have a little summer fun is to take a dip in the pool, and a great way to add beauty and accessibility to your pool or spa is with a custom pool or spa deck from Archadeck of Central Maryland and Archadeck of Montgomery County. Pool and spa decking can play a huge role in the aesthetics and range of uses for your pool or spa. A well planned and executed pool or spa deck can transform your pool area into an extension of your living space. A place you want to spend time on even when you aren’t using your pool or spa. There are a wide variety of shapes and styles available to complement your area and a wide range of quality materials to construct your outdoor oasis from. One such material is composite decking which lends itself to use around a pool or spa because of all the attributes it carries. Composite decking materials such as Trex, AZEK, TimberTech, and Fiberon are mold and mildew resistant and won’t fade or warp from exposure to the summer sun. Composites come in a multitude of finishes, some so close to real wood you have to reach down and touch it to know the difference. Many of today’s composites are made with slip resistance in mind, providing a safer decking material to use around pools and spas. Composites won’t retain heat or splinter on those hot summer days, so they are easy on the feet as well as on the eye. Leaders in the composite decking industry have warranted their decking boards for as much as 30 years, proof positive that composites are the real deal. 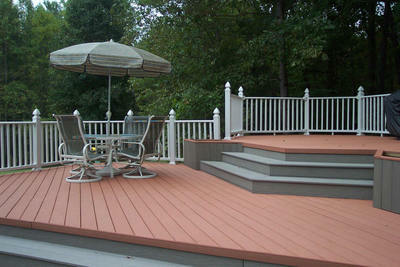 In the world of decks composites are leading the way in strength, durability and aesthetic appeal. This deck and pergola combination by Archadeck of Maryland in no exception. This deck was built of Fiberon. Fiberon like other composite brands enjoys the benefits of low maintenance, fade and stain resistance, water and mildew resistance and hues that match the natural beauty of real wood. Composite decks give you the freedom and flexibility to create a myriad of outdoor structures in all shape and sizes. Upkeep and maintenance on composite decks is limited to washing it twice a year to remove any dirt or pollen. This can usually be achieved with as little effort as sweeping. Composites such as Fiberon are earth friendly as well, being constructed of recycled materials. You get a deck as strikingly beautiful as it is carefree deck! Composite decking uses polymer technology and high density polyethylene resin. This particular construction is stunning with the contrast of the wood hues against the white railing. We also created separate spaces for grilling and entertaining by utilizing a step down area for these homeowners. The pergola adds a design element and a defining focal point for the structure. This deck is definitely the place to be all season long.